Thank you for this. Due to being recently disabled I am forced to think about trying to earn money from my crafts. After reading this I realize that I need to change my mindset. Thank you for taking the time to read this, we’re glad the article was helpful! Mary, Thank you for posting this. As someone new to leathercraft, this is very helpful information. I see that I need to rethink pricing before selling to the public. Thank you, David! We’re glad you found the article helpful. Hi Weaver Leathercraft, I would like to thank you for sharing this article. I found this article very informative both in pricing & confidence. Our family has had a company in the UK since 1921 and as per the article, I can’t afford to purchase the items I make. I have found that it is very important to disassociate yourself and not try and justify your prices depending upon your own income, because you are NOT the customer. This can be very difficult at times. The notes on pricing are a general starting point guide and are also very useful. The main thing is add value to your product & build your brand. My grandad use to say, you are your product, your product is you, meaning knownone buys anything from someone they don’t like! Lastly, I should say that we made our 1st transaction with Weaver Leather a few weeks ago and I found them really nice and helpful. Thank you so much for your comment! We’re so glad the article was helpful and informative and that your first transaction with us was helpful and friendly! The fact that your family business has been running since 1921 shows that you have a passion for what you do. Thanks again! Great article! I think having the confidence that my work is good enough to justify the retail price is definitely a mind set I need to overcome. We’re so glad you found the article helpful! I just started out I leather, I find Weaver there’s no care for that new Leatherworker, for something that cost $350 to$400 in the catalog, but when I call weaver want over $800. You pork the little,…so we have to use Tandy or other leather shop….Weaver charge what in the catalog….. i’m at 20 year veteran of military and given my life to my country and my phone Weaver tries to rip us off. Think you for the reply to my email, since I do not have the income needed I was shock to find out I must buy $500 a year. It’s not much to some guy making trade shows, or a shop…but I’m a guy that sets in his back yard Shed, learning, so there no way I’ll have that income…..but hand down, Weaver tools is like buying craftmen tool…….my opinion still stand, weaver makes me buy second class tools….but in my heart I can’t pay $800 for some you sell for $350 to $400……someday I’ll be a high roller too. Very good information, thank you. Like others have mentioned, changing my pricing mind set is now a must. I’ve given away more then I’ve sold and I’m clearly under pricing what I have been selling. The price I have difficulty coming up with is a material costs. If I buy a side at, say, $120.00 do I just divide the number of potential projects into that? Spool of thread, leather cements and dies or stains? I’m just at a loss to figure out my materials costs so I can accurately come up with a retail price. 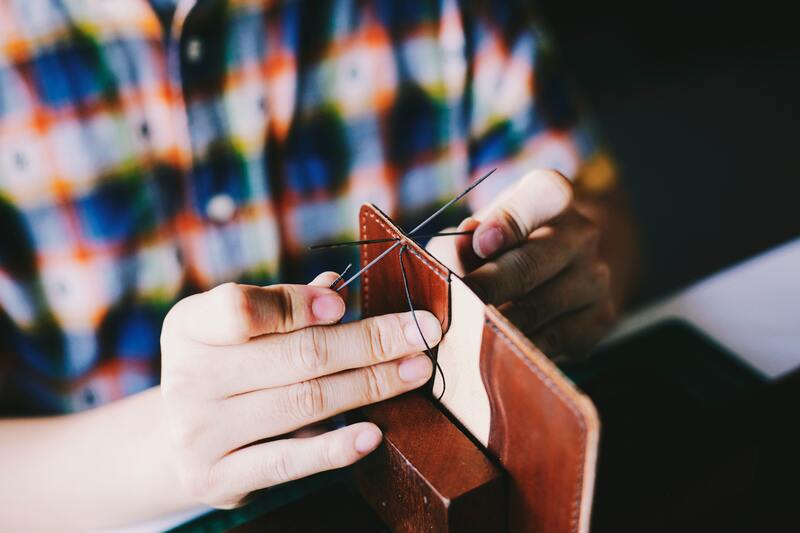 Unless you’re using the same amount of leather for each project you’ll need to calculate your leather materials costs per product individually. First determine how much your leather is per sqft. So if you make a bag that uses 3 sqft of leather and you buy a side of leather which is 20sq ft for $120. You would first divide the $120 by 20sqft to get the price per sqft which is $6. Then multiply the $6 by 3 sqft and get $18 in leather costs for the leather bag. If you were making a wallet and only needed 1 sqft, your leather cost would be $6. Make sense?